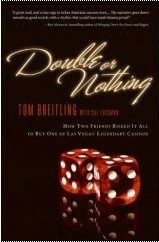 I recently got an e-mail message from the PR team at HarperCollins (HC) for Tom Breitling's book Double or Nothing. Although I'm not interested enough in the topic to read the book I have to admit the message got my attention. Why? HC is offering access to the entire book for free on their website till April 14th. So if you really think you can read a 256-page book via HC's Browse Inside service, go for it! Details are on Tom's site and here's the link to HC's Browse Inside access for the book. The reality is very few people are going to read the entire book online even when the price is zero. Rather, what HC is doing is leveraging their Browse Inside service to see how much of a sales bump they can create by providing full access for a limited period of time. As a fellow publisher, I'm intrigued by the experiment. And thanks to the magic of Bookscan data, I can keep an eye on the sales trends during and after the free access period. My gut tells me they could leave the full access in place indefinitely and it would only help sell more copies in the long run... Regardless, I love it that a major trade publisher like HC is experimenting like this with free access to e-content. JW: Let's start by talking a bit about ZDocs. What's the core mission of ZDocs and how do you differentiate your services from others out there? ZDocs offers companies and individuals short-run on-demand printing, but if a customer will be better served by another type of production, we help guide them to make the right decision for their business, even if that means the customer may use another vendor. For independent authors, deciding on the right quantity is really up to the marketing plan the author has created. While one-off on-demand printing, what POD publishers specialize in, works for many authors, I personally think if an author is serious about building a business around his or her book, then the author should print at least 250 books. Authors, especially non-fiction authors, will find they need to give quite a few books away as part of their initial promotional efforts. JW: Your other operation, Authors on the Net, is one a lot of readers are likely to be very interested in. The subject of author platform is a popular one on my blog. How does Authors on the Net help an author with their platform? PD: We help authors take a structured approach to building their platform online. When I started writing my book, Fast & Furious Book Promotion: A system for promoting books online, I was going to focus on blogging and social networking as the way to build a platform and rise above the crowd to either build a successful self-publishing business or get picked up by a publisher. But as I spoke with authors printing with ZDocs, I soon realized that many authors were using Myspace and blogs and websites and they were building email lists etc., but not one of the authors we worked with had a cohesive plan. They were just throwing pebbles into the ocean hoping something would happen. I can’t tell you how many authors told me they had made four blog posts yet no reader had left them a comment or bought their book. Building a platform takes time and that is one of the key messages in my book. The foundation of Authors On The Net is built on the DRILL concept. We want authors to learn how to use the Internet to build their platform, and we want them to move fast and furiously, but we also want them to commit at least three years to their promotional efforts, keeping in mind that even if their current book does not sell too well, the platform they've built can be used for their next project. JW: The Authors on the Net website talks about helping authors create marketing plans for a retailer like Barnes & Noble. How hard is this and can a typical author really influence the marketing plans of a major brick-and-mortar chain? PD: We have three tools authors can use to build their plans: a PowerPoint model, a Word model and a simple spreadsheet. Since no author I’ve worked with could show me a plan for their book, I decided to keep the planning tools as simple as possible. I believe many people think a marketing plan is a complicated document that requires an MBA. When an author follows the DRILL system, he/she will have a simple, yet powerful plan in place. Just knowing your goals and target audience will put an author ahead of the pack. A plan we just created for a book How To Become a Total Failure, generated a phone call from Barnes & Noble. We’re not sure what this means yet, but getting Barnes & Noble to express interest was a nice validation of the effectiveness of these plans. I’m pretty sure that without our plan, we would have received a polite rejection letter. Whether a typical author can influence the marketing plans of a brick-and-mortar chain depends on the book. Some books are just too niche to merit significant effort on the part of the bookstores, but other books that appeal to a large audience could have an impact. The point I’d stress, however, is an author will not be considered at all if he or she does not have a solid plan supporting his or her book. JW: Virtual book tours and trailers are getting a lot of buzz these days and I see Authors on the Net also offers guidance there as well. What are some of the more effective strategies you've seen authors implement with either of these tools? PD: I just did a virtual book tour for Fast & Furious Book Promotion. We had over 20 people on the call and I could only get through about 10 questions. I didn’t sell a book, but I did get over 40 new people into my platform. But for me, the best value I got out of the call were the questions. We ran an "askphildavis.com" campaign and collected many good questions. These questions are leading me to a new product, which is a tool to help authors run a book campaign much like Barack Obama and other politicians are running their political campaigns. I liked the feedback so much, I decided to leave the askphildavis link on the site so we can continually receive questions from authors. A virtual book tour for me is valuable to get market intelligence. While it would be great to sell books, it’s not the most important result for me. A fiction writer, on the other hand, can use the same tool and structure the call completely different. The fiction writer could have three people help her read different sections form her book. The point is that once an author becomes comfortable with a new tactic, he or she can then "invent" a way to use that tactic to meet his or her needs. Regarding book trailers, I think they are a great promotional tool. If you put a video on YouTube and 1,000 people watch it, well, that's 1,000 more people who now know your book exists. I like the marketing concept of "hooks in the whale." To catch a whale, you have to put many hooks in it. To catch a customer or a reader, you also have to have many hooks out there. A book trailer is a cost-effect way to create one such hook. JW: I see you have a one-stop product coming next month called Self-Publishing in a Box. This whole sector seems to be in a constant state of flux as new technologies and service providers arise. What solutions can authors expect to find in this product and what are your plans to keep the content fresh down the road? PD: Yes, the book led to the website and the website then led to Self-Publishing in a Box. What we learned during the soft-launch of Authors On The Net is that authors needed even more structure. So we created a seventeen week program that walks authors through the process of getting a professional book published and a strong online presence built. The idea is that all authors need to do certain things, like getting listed in Baker & Taylor, writing a promotional plan, using a professional editor and designer, listing their book all over the place, building a platform, using press releases and what could become the most important tactic of all, using social networks like Facebook to run a book campaign. While most authors understand what it means to get published by a traditional publishing house, some authors struggle with the difference between publishing with a POD or Vanity press and truly self-publishing. One of the biggest differences is when you self-publish you start your own publishing company. Two other key differences are that you buy your own ISBN and you do not share royalties with anyone. The kit helps authors make these critical decisions. I’m not against POD publishing and I think for many authors that form of publishing is the right choice. My interest lies in helping authors choose the right way to publish based on their goals and overall plan. Regarding change, I don't see the concepts in the kit changing too much, but as we will be printing on demand, when significant changes take place, we can make those changes. What will change at a Fast & Furious rate are the online tactics. How to use Amazon will change, how to social network will change, new tools will emerge and so on. This is why the website is so critical. We can let people know about new tools on our blog, in our categories and sections and even more importantly, we can learn from other authors in the forums. In conclusion, I'd like to say that one of the hardest parts of my business plan for Authors On The Net is that we are not trying to help people become New York Times best selling authors or millionaires from their books. It can be hard to attract people without the hype. But we've added over 200 authors, both published and self-published, to the site during our three-month soft launch, so I'm encouraged. What we want to do is help authors find their readers and sell profitably to those readers. Whether a book becomes a best seller depends on so many factors outside the control of most authors. Self-Publishing in a Box and the website Authors On The Net is all about building a solid platform authors can use to take their current book to the next level or possibly use for their next book. Promoting and selling books is a daunting and sometimes overwhelming task. Self-Publishing in a Box and Authors On The Net was built to ease the process for both published and self-published authors. All You Can Eat iTunes: What Could It Mean for Books? There's renewed speculation that Apple could be working on an unlimited music subscription model similar to the Rhapsody model. The deal appears to hinge on Apple sharing part of the hardware sales revenue with the record labels. As long as Amazon is unable to keep up with Kindle backorders they probably have no incentive to consider a service like this. But once manufacturing catches up with demand this could be the spark that really ignites the e-book market. And keep in mind it would just be another option for customers to consider. Kindle owners would be free to buy one book at a time as they always have, just like Apple would still offer single track sales even if they eventually add an all-you-can-eat option to iTunes. JW: At Fractal Press you're planning to produce a print book on personal finance using the best of the blogosphere. Where did this idea come from and how has it evolved? NA: The general idea is to build multi-author books based on valuable existing content in the blogging community. Our approach is heavily inspired by Art de Vany and Nassim Taleb. The idea first came up when we approached the question: "What can we do if we don't know anything?" So it was essentially a risk-management issue and the problem of acting under uncertainty. Fractal Press is one instantiation of the general framework that emerges from studying this question. Positive-skew (low-downside, potentially high-upside), massive diversification, and power-law (long-tail) environments were what we were looking for. I initially pitched the idea as "Fallible Publishing" that involved diversification across as many dimensions as possible (multi-author books) and benefiting from the massive bottom-up tinkering going on in the blogosphere. As we worked with the idea we realized that there are plenty of other benefits that emerge when we work with content in the blogosphere. For instance, it has been shown that artists who worked on their pieces without any monetary incentives show more "flow" and enjoyment of the process when compared to artists who worked on similar pieces but with monetary incentives. Bloggers write on topics that they care about, while we play a minimal role in terms of editorial direction, heavy-handed changes, or monetary incentives during the creating process -- we believe this vastly improves the author-publisher relationship and makes it much less adversarial than is usually the case. We also realized that we offer a pretty unique way for bloggers to monetize their content without compromising the design and aesthetics of the blog. I've written about our fallible approach in general in a post on our philosophy and another on editorial control. JW: How can personal finance bloggers get involved in the project and how will they be compensated? NA: Personal Finance bloggers can simply email me at navanit@fractalpress.com, or they can install our button to help us find them. We have been fortunate in that we already have some of the top Personal Finance bloggers appearing in our anthology. These are folks who have been featured in The New York Times and write regularly for major online financial channels in addition to blogging. We are currently moving forward based on recommendations from them. We also use rankings from del.icio.us, technorati, and other blog tracking tools to help us make decisions on which blogs to follow up with. Bloggers will be compensated like regular authors based on a percentage of the proceeds from the sales of the book. Given our approach to risk management, we can afford to be particularly generous with our authors. A traditional publisher has to pay the bills while they wait for an author to finish the book in a year or so, we don't have that problem since we use existing content and can get a book out much more quickly. We donate the proceeds from the first 100 sales to charity. JW: Are you planning to leverage the blogosphere for PR and general visibility in the market? Can you share any of your marketing plans with us at this point? NA: I think this is where our understanding of uncertainty, particularly the mathematics of information cascades will come into play. One of the best features of having so many contributors in an anthology is the large number of "seeding" points that can trigger an information cascade. Our approach will resemble a "starburst" release akin to releases in the movie industry. We are also experimenting with other ideas such as the new Kindle and ebook platforms that are being introduced. Essentially, we hope to leverage the digital medium to drive sales in the real world. JW: Is it safe to assume you're running this project through a print-on-demand vendor? If so, which one and when do you expect to have books available? NA: Yes, print-on-demand is the best way to manage the uncertainty in this business. We're working with Lightning Source, a print-on-demand provider based in Tennessee. We are also looking into other providers and keeping an eye on the competitive landscape. We expect to launch the Personal Finance anthology by the end of April. It should get easier and quicker after the first book is out when we'll be able to streamline our processes and focus on building momentum. JW: Are you planning follow-up books to the personal finance one? If so, are you sticking with the financial area or venturing into other sectors? NA: We have many other topics in mind including productivity, fitness, and entrepreneurship. There are some fantastic bloggers in these areas. We're also looking into working with particularly prolific individual bloggers who have great content that can be molded into a book. Based on our focus on diversification, we will venture into as many sectors as possible . In the future our decision-making around this will be influenced by the success of our past books and our ability to leverage existing information cascades. Have you read Wikinomics yet? If not, you need to! Here's my earlier review of the book. Either way, you'll want to grab a free PDF of "the final chapter" entitled The Wikinomics Playbook: Mass Collaboration in Action. As promised, this piece was written and developed in an open forum and features coverage of wiki evolution, leadership in collaborative communities, transparency and government (which is probably the first time those last two terms have been used together!). If you can't tell by now, I'm a big fan of Don Tapscott, co-author of Wikinomics. If you are too, be sure to check out his New Paradigm website as well as the Wikinomics blog.